For game news: I'm still hammering away day after day, hoping it'll all be worth it. I bought some Steam games for the summer sale that I've been curious about and was encouraged that SCK will hold up well in comparison. Fingers crossed! Italy was eliminated from the world cup and, coincidentally, a fan in Italy posted this picture of the packaging his t-shirt came in on the same day. I thought it was very appropriate. Translation: "Always forward friends, and on to VICTORY!" Visit www.Kittadyne.com if you have a project you need cut out of aluminum! He's my BFF and does great work. I downloaded his game and it was fairly bad, but had some flashes of brilliance. There's a puzzle where you use a paintbrush to paint the walls in a dark room with glowing moss so you can see the platforms well enough to get to the exit. Dedicating time to code and perfect a gameplay mechanic like that, that will likely only be used once, is what makes indie games special. Here's a screenshot of exactly what I'm working on at 1:05 PM Pacific Time on Thursday 6/19/2014 (the time of this post). Can you relate to that video? I feel a bit of writer's block going on right now with Super Chibi knight. SO MUCH LEFT TO DO! To try to deal with it, I switched strategies and am just busting stuff out with placeholder art to eventually go back and re-do with final art later. It seems to be going ok, but I'm still feeling slightly overwhelmed. What do you guys do to work through that "blocked" feeling? Reminder to answer this question: What do you guys do to work through that "blocked" feeling? If you've been following me you know that I've been implementing the new AS3 GameInput API in Super Chibi Knight. I promised I'd make an intro tutorial about getting started with the API, and I finally did, here! You can download a source .fla from that page if you need a FULL example. If you pledged to the SCK Kickstarter at $85 or lower, you should have received your physical rewards by now, higher pledgers will be getting theirs soonish due to a delay in getting the keychains manufactured. I'm gonna plug my friends' Language Learning interactive game/book here again. Please check it out and spread the word if you know anyone who's trying to learn another language. Oh, and leave them a review with your thoughts on their game. THANKS! Leave me a comment if you have any Qs about game pads and Flash or the GameInput API, I tried to make it as simple and clear as possible with a good example, but it can still be tough to wrap your head around since it works quite differently from keyboard inputs. Learn Japanese, Spanish, or Chinese?!?! My good friends who helped make Nephi's Adventure 1 and Nephi's Adventure 2 have started a new business to teach people to speak other languages! It's called Lexikeet Learning! Plz leave them some feedback on what you think of their efforts! What controller do you use to play Steam/PC Games? Tell me in the comments! I spent the last few days getting stuff sorted, packed, and addressed for the Super Chibi Knight Kickstarter physical rewards. Did you know shipping for posters is really expensive??!! Especially internationally! 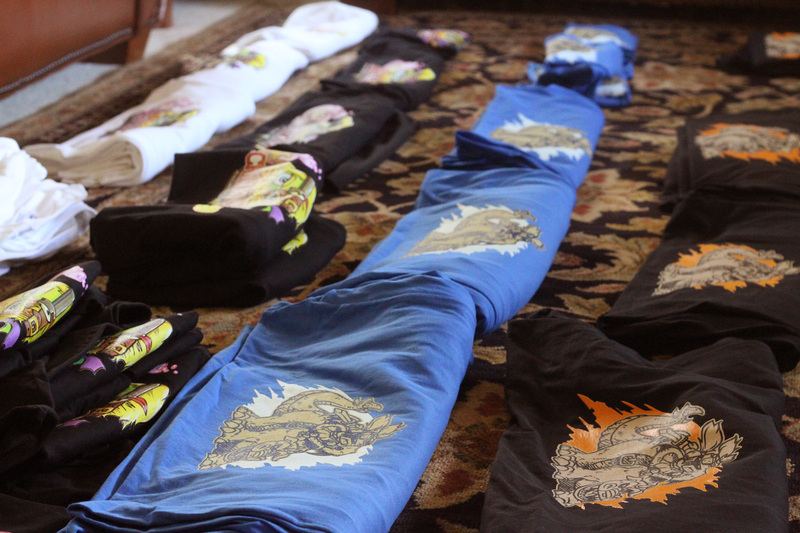 If you missed out on the Kickstarter, I'll be offering the leftover t-shirts on my website pretty soon. Are you excited for Super Chibi Knight yet? I went to visit my in-laws for Easter and made this video one evening with my bro. in law. He wrote and recorded the song, and stars in the video! Silly! I also finally got all the ducks in a row for the t-shirt orders from the Kickstarter campaign, they're being printed now! They should be ready to mail out in about 2 weeks! I'll have some extra shirts from the print run, would you all be interested in buying a few if I put them up for sale on my website? I'm going to livestream for a little bit at 10:30pm Pacific Daylight Time (1:30 pm Eastern Daylight Time). I'll be arting up a new level in Super Chibi Knight and maybe messing around with a logo design for a friend's running team. This is mostly an experiment to mess with livestream settings and stuff. UPPPDAAATEEEE on SUPER CHIBI KNIGHT! 1. I have a giant spreadsheet of people's addresses and preferences for SCK t-shirts and keychains and posters and stuff from the Kickstarter campaign... I think I'm ready to actually place an order... trying not to do anything stupid that makes me spend more than I need to. 3. Feeling pretty pumped about beginning to add more content to the game and inch closer to that finish line! Keep me motivated you encouraging people! 4. If I did a weekly livestream, what day and what time (in Pacific Daylight Time) would you want to tune in? I now have to start the process of fulfilling Kickstarter physical rewards (t-shirts, posters, and keychains) but before I can do that I have to wait for all the Kickstarter backers to fill out the survey I emailed them to set their choices. Another interesting note for anyone thinking of doing Kickstarter, about 5% of the total amount didn't come through because of processing errors (expired cards, insufficuent funds, etc.) Some people are correcting the problem, but some are just ignoring it. Some even emailed saying "I thought it would charge me right away, not a month later!" Welcome to Kickstarter! 5% is a significant chunk of cash, even for my small-scale Kickstarter... I can't imagine the people who raise 100k or 1mil on KS. While I'm waiting for that stuff, I started messing around with languages other than Actionscript. I downloaded Microsoft Visual Studio and messed around with c# - It wasn't too bad, but there are a lot of little strict things about it that annoyed me (like requiring you to define an array's length when you create it...). Super Chibi Knight might be the last "BIG" game I make in Flash... well, that I make ONLY in Flash. I still think Flash's animation and drawing tools are great! Speaking of SCK, I decided to port everything over to FlashDevelop because Flash was taking too long to compile and navigate around the file. I am now suffering for my past sins of disorganization in Flash. All kinds of reference errors and stuff are popping up because of the new "no frames" structure. I basically have to go through thousands of lines of code and optimize them for the new setup. I think it'll be worth it in the long run. Oh, did I mention that I got a call from Nintendo and they approved me to be a WiiU developer? So, that's pretty cool! This post was really long, sorry! In reality, I'm now pretty focused because I know what I need to do for the next 4 months... it's all laid out, just have to hoe the row now. Leave me a comment to encourage and embolden me!